(Nanowerk News) At extremely low temperatures atoms can aggregate into so-called Bose Einstein condensates forming coherent laser-like matter waves. Due to interactions between the atoms fundamental quantum dynamics emerge and give rise to periodic collapses and revivals of the matter wave field. A group of scientists led by Professor Immanuel Bloch (Chair of Experimental Physics at the Ludwig-Maximilians-Universität München (LMU) and Director of the Quantum Many Body Systems Division at the Max Planck Institute of Quantum Optics in Garching) has now succeeded to take a glance 'behind the scenes' of atomic interactions revealing the complex structure of these quantum dynamics. By generating thousands of miniature BECs ordered in an optical lattice the researchers were able to observe a large number of collapse and revival cycles over long periods of time. The experimental results imply that the atoms do not only interact pairwise - as typically assumed - but also perform exotic collisions involving three, four or more atoms at the same time ("Time-resolved observation of coherent multi-body interactions in quantum phase revivals"). On the one hand, these results have fundamental importance for the understanding of quantum many-body systems. On the other hand, they pave the way for the generation of new exotic states of matter, based on such multi-body interactions. The experiment starts by cooling a dilute cloud of hundreds of thousands of atoms to temperatures close to absolute zero, approximately -273 degrees Celsius. At these temperatures the atoms form a so-called Bose-Einstein condensate (BEC), a quantum phase in which all particles occupy the same quantum state. Now an optical lattice is superimposed on the BEC: This is a kind of artificial crystal made of light with periodically arranged bright and dark areas, generated by the superposition of standing laser light waves from different directions. This lattice can be viewed as an 'egg carton' on which the atoms are distributed. Whereas in a real egg carton each site is either occupied by a single egg or no egg, the number of atoms sitting at each lattice site is determined by the laws of quantum mechanics: Depending on the lattice height (i.e. the intensity of the laser beam) the single lattice sites can be occupied by zero, one, two, three and more atoms at the same time. The use of those 'atom number superposition states' is the key to the novel measurement principle developed by the researchers. The dynamics of an atom number state can be compared to the dynamics of a swinging pendulum. As pendulums of different lengths are characterized by different oscillation frequencies, the same applies to the states of different atom numbers. “However, these frequencies are modified by inter-atomic collisions. If only pairwise interactions between atoms were present, the pendulums representing the individual atom number states would swing synchronously and their oscillation frequencies would be exact multiples of the pendulum frequency for two interacting atoms”, Sebastian Will, graduate student at the experiment, explains. The results reported in this work provide an improved understanding of interactions between microscopic particles. This may not only be of fundamental scientific interest, but find a direct application in the context of ultracold atoms in optical lattices. Owing to exceptional experimental controllability, ultracold atoms in optical lattices can form a 'quantum simulator' to model condensed matter systems. Such a quantum simulator is expected to help understand the physics behind superconductivity or quantum magnetism. 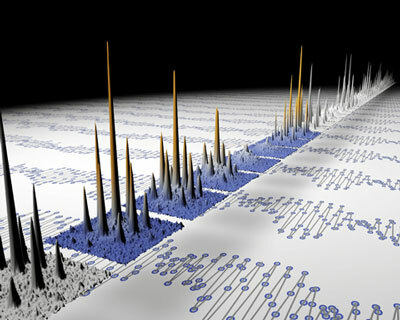 Furthermore, as each lattice site represents a miniature laboratory for the generation of exotic quantum states, experimental set-ups using optical lattices may turn out to be the most sensitive probes for observing atomic collisions.